What makes your neighbourhood special? This is the question that a community in London, England first asked about 30 years ago. They began the Local Distinctiveness Project, a social effort to find what was special about their community. The focus of the project had two parts. First, they encouraged people to discover what was distinct and uniquely wonderful about their place, and secondly they tried to find out what could make their neighbourhood even more wonderful. Today in dozens of communities, neighbours have worked hard to discover what makes their place special. They would gather to walk through their community, share stories and discoveries, and then highlight the very best of their place. In the end, some communities have come to celebrate amazing local cheeses, rare birds, special buildings, wonderful cafes, and more. What they find is that even the most bland neighbourhoods have so much more to celebrate than they first realized. In fact, some plain neighbourhoods are emerging as diamonds in the rough. As a result of the Local Distinctiveness Project in England, vast collections of stories and discoveries have been made about places across the country and around the world that truly highlight what is special. Those who thought their places were uninteresting and boring have found that they live in a wonderland ready for discovery. • Fight for AUTHENTICITY and integrity. Keep places lived in, worked in, and real. • Demand the BEST of the new. • Let the CHARACTER of the people and place express itself. Give local shops precedence. • Defend DETAIL. No new building or development need not be bland, boring, or brash. • ENHANCE the natural features – rivers and brooks, hills and valleys, woods and heaths. • Take the place’s FINGERPRINT. Think and talk about places and people. • Get to know your GHOSTS. The hidden and unseen stories are as important as the visible. The list goes on. Their point is clear: when we pay attention to where we live and work with others to care for our place, beauty will always be found. Chestermere is a distinct city with special features, a fascinating history, inspiring characters, and a promising future. When we embrace what is wonderful about Chestermere we become a part of the story. As we discover our place we realize that we’re discovering much more than ponds and shops, we’re really rediscovering a love for the place we call home. When we love our place, we may discover something even better. We may find that we also love the people who live here with us. 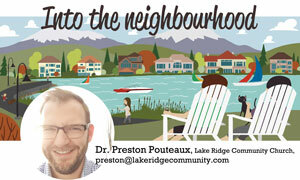 May you discover again the joy of living in Chestermere and find delight in the people who live here with you. There is goodness just around the next corner, it is yours to find. Happy hunting!